Lattice corneal dystrophy is a rare inherited condition characterized by amyloid deposition in the corneal stroma. It is a bilateral, slowly progressive disease that results in recurrent corneal erosions and decreased vision due to opacification of the cornea. There are two genetically distinct types of lattice corneal dystrophy: lattice corneal dystrophy type I (classic type), which is a primary amyloidosis localized to the corneas only, and lattice corneal dystrophy type II (gelsolin type, or Meretoja syndrome), which has systemic amyloidosis manifestations. The onset of corneal changes generally occurs in the first decade of life in lattice corneal dystrophy type I and in the fourth or fifth decade of life in lattice corneal dystrophy type II. Affected individuals may first develop recurrent corneal erosion syndrome, which is a recurring painful breakdown of the corneal epithelium. Vision compromise generally occurs much later as the density of amyloid deposits in the corneal stroma increases. Lattice corneal dystrophy is inherited in an autosomal-dominant fashion. The genetic defect of lattice corneal dystrophy type I has been mapped to the TGFBI (BIGH3) gene on chromosome 5q. [3, 4] Lattice corneal dystrophy type II results from a mutation in the GSN gene. Treatment of lattice corneal dystrophy includes management of recurrent corneal erosion syndrome and rehabilitation of lost visual acuity. Recurrent erosion syndrome may be treated with hypertonic saline drops, lubricating drops, bandage contact lenses, or laser surface ablation. When compromised visual acuity occurs, treatment options include laser surface ablation and partial or full-thickness corneal transplantation. These treatment modalities have a high success rate, and most patients are able to retain good visual acuity throughout life with proper care. Lattice corneal dystrophy (LCD), an IC3D category 1 dystrophy, is an autosomal-dominant condition and one of the most common stromal dystrophies. It is a slowly progressive disease that results in significant discomfort and visual impairment. Like granular and Avellino dystrophies, the genetic defect of lattice corneal dystrophy type I has been mapped to the TGFBI (BIGH3) gene on chromosome 5q. [3, 4] Lattice corneal dystrophy type II results from a mutation in the GSN gene. Onset of corneal changes in lattice corneal dystrophy type I usually occurs in the first decade of life, although patients may remain asymptomatic for years. Examination of the cornea in the second to third decade of life reveals branching, refractile lattice lines with intervening haze, which are observed best in retroillumination. An example of lattice corneal dystrophy is shown in the image below. Lattice corneal dystrophy. Image courtesy of James J. Reidy, MD, FACS, Associate Professor of Ophthalmology, State University of New York, School of Medicine & Biomedical Sciences, Buffalo, New York. The cornea is the clear outer coat of the front of the eye. A dystrophy of the cornea is defined as a bilateral noninflammatory clouding of the cornea. Corneal dystrophies can be placed into 3 categories based on their location within the cornea: (1) Anterior corneal dystrophies affect the corneal epithelium and may involve the Bowman layer, (2) stromal corneal dystrophies affect the central layer of the cornea (the stroma), and (3) posterior corneal dystrophies involve the Descemet membrane and the endothelium. Lattice corneal dystrophy is primarily a stromal corneal dystrophy that starts as fine, branching linear central opacities in the Bowman layer and that spread to the periphery. Although the process may involve the deep stroma, it does not reach the Descemet membrane. The age of onset for most corneal dystrophies is less than 20 years (exceptions include map-dot-fingerprint dystrophy and Fuchs corneal dystrophy). Most corneal dystrophies are inherited in a dominant pattern. Exceptions include macular corneal dystrophy, type 3 lattice corneal dystrophy, and the autosomal-recessive form of congenital hereditary endothelial dystrophy. Excessive corneal erosions can lead to decreased visual acuity, which may require a corneal transplant or phototherapeutic keratectomy (PTK). No sexual predilection is noted. The predominantly bilateral nature of lattice corneal dystrophy type I and type II contributes to the morbidity of this condition. The painful recurrent erosion syndrome associated with lattice corneal dystrophy may result in frequent visits to the ophthalmologist and loss of productivity. Loss of visual acuity may progress from mild blurring of vision to debilitating blindness. Fortunately, recurrent erosions and vision loss due to corneal opacity are treatable. Patients should be educated regarding the autosomal-dominant inheritance of lattice corneal dystrophy and understand its implication in childbearing. Family members should be counseled to establish care with an ophthalmologist, even during childhood or adolescence. Patients should be educated on the natural history of lattice corneal dystrophy, including issues surrounding recurrent corneal erosion syndrome and loss of corneal clarity. They should be informed that treatment options are available and that, despite the recurrent nature of the condition, proper management often enables good visual acuity throughout the patient’s lifetime. 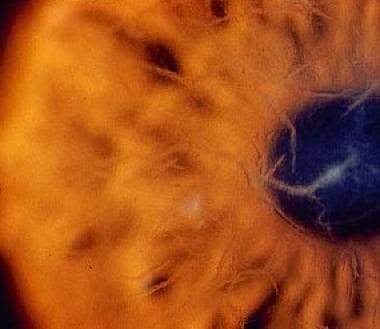 Patients with lattice corneal dystrophy type II should be educated on the systemic manifestations of amyloidosis and be referred to the appropriate medical specialist. Klintworth GK. Corneal dystrophies. Orphanet J Rare Dis. 2009 Feb 23. 4:7. [Medline]. [Full Text]. Weiss JS, Møller HU, Lisch W, Kinoshita S, Aldave AJ, Belin MW, et al. The IC3D classification of the corneal dystrophies. Cornea. 2008 Dec. 27 Suppl 2:S1-83. [Medline]. [Full Text]. Stone EM, Mathers WD, Rosenwasser GO, et al. Three autosomal dominant corneal dystrophies map to chromosome 5q. Nat Genet. 1994. 6(1):47-51. [Medline]. Klintworth GK, Bao W, Afshari NA. Two mutations in the TGFBI (BIGH3) gene associated with lattice corneal dystrophy in an extensively studied family. Invest Ophthalmol Vis Sci. 2004 May. 45(5):1382-8. [Medline]. Musch DC, Niziol LM, Stein JD, Kamyar RM, Sugar A. Prevalence of corneal dystrophies in the United States: estimates from claims data. Invest Ophthalmol Vis Sci. 2011 Aug. 52(9):6959-63. [Medline]. [Full Text]. Meretoja J. Familial systemic paramyloidosis with lattice dystrophy of the cornea, progressive cranial neuropathy, skin changes and various internal symptoms. A previously unrecognized heritable syndrome. Ann Clin Res. 1969 Dec. 1(4):314-24. [Medline]. Das S, Langenbucher A, Seitz B. Excimer laser phototherapeutic keratectomy for granular and lattice corneal dystrophy: a comparative study. J Refract Surg. 2005 Nov-Dec. 21(6):727-31. [Medline]. Morita Y, Chikama T, Yamada N, Morishige N, Sonoda KH, Nishida T. New mode of treatment for lattice corneal dystrophy type I: corneal epithelial debridement and fibronectin eye drops. Jpn J Ophthalmol. 2012 Jan. 56(1):26-30. [Medline]. Resch MD, Schlotzer-Schrehardt U, Hofmann-Rummelt C, Kruse FE, Seitz B. Alterations of epithelial adhesion molecules and basement membrane components in lattice corneal dystrophy (LCD). Graefes Arch Clin Exp Ophthalmol. 2009 Aug. 247(8):1081-8. [Medline]. Albert D, Jakobiec F. Principles and Practice of Ophthalmology. 1994. Vol 1: 26-49. Das S, Langenbucher A, Seitz B. Delayed healing of corneal epithelium after phototherapeutic keratectomy for lattice dystrophy. Cornea. 2005 Apr. 24(3):283-7. [Medline]. Kawashima M, Yamada M, Funayama T, et al. Six cases of late-onset lattice corneal dystrophy associated with gene mutations induced by the transforming growth factor-beta. Nippon Ganka Gakkai Zasshi. 2005 Feb. 109(2):93-100. [Medline]. Krachmer J. Cornea (3 volume set). Vol 2: 1996. Mashima Y, Yamamoto S, Inoue Y, et al. Association of autosomal dominantly inherited corneal dystrophies with BIGH3 gene mutations in Japan. Am J Ophthalmol. 2000 Oct. 130(4):516-7. [Medline]. Vanlerberghe V, De Craene S, Kestelyn P. Let this be lattice? Dendritiform erosion in lattice dystrophy type I, a source of confusion. Int Ophthalmol. 2015 Feb. 35(1):121-3. [Medline]. [Full Text]. Woreta FA, Davis GW, Bower KS. LASIK and surface ablation in corneal dystrophies. Surv Ophthalmol. 2015 Mar-Apr. 60(2):115-22. [Medline]. [Full Text]. Meretoja J. Comparative histopathological and clinical findings in eyes with lattice corneal dystrophy of two different types. Ophthalmologica. 1972. 165(1):15-37. [Medline]. [Full Text]. Slit lamp image of lattice corneal dystrophy. Image courtesy of James J. Reidy, MD, FACS, Associate Professor of Ophthalmology, State University of New York, School of Medicine & Biomedical Sciences, Buffalo, New York.